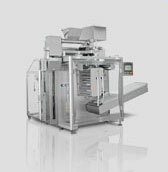 For 40 years, packaging machines for the food and pharmaceutical industries. Kraft, Nestlé, Ferrero, Unilever, Bayer, Novartis are just some of our customers, using OMAG packaging machinery every day in over 100 countries worldwide. To complete our machinery line-up, we’ve designed models that are customized for the pharmaceutical sector, the PHARMASACHET and PHARMASTICK packaging machines. These machines provide innovative and technologically advanced pharmaceutical packaging solutions, allowing the packaging of powders and granules, gels, creams and liquids. OMAG thanks to its strong expertise and experience in the field, has developed COMPLETE LINES equipped with the most advanced dispensing systems, carton packaging and weight control systems according to the most demanding URS and in compliance with GMP guidelines. OMAG makes available to customers a technical support service that encompasses all phases of the machine’s design and production: pre-sales, installation and initial operation, and throughout the machine’s working lifetime. Each and every customer benefits from service support with our qualified staff via telephone or e-mail, and, on request, a remote-servicing option that allows for a “real time dialogue” with automatic packaging machinery to check on operations. Our well-stocked spare parts warehouse and capability of machining any component in-house reduce machine downtime to a minimum. Thanks to our especially efficient computerized system, we can trace any machine part, retrieve its history and build the component if necessary. Where an on-site intervention is required by one of our technicians, OMAG can arrange for qualified service support within 24 hours. Meeting with customers is especially important to us, since it provides us not only with an opportunity to verify a project’s specifications, but above all, allows customers to view our packaging machines up close. In fact, OMAG’s dedicated packaging test department is equipped with a range of machinery for various types of products: production tests are performed free of charge using the customer’s products and packaging, identifying and verifying the best filling solutions, packaging speeds and filling tolerances. This allows us to propose packaging machines that guarantee declared performance requirements right from the quotation phase. OMAG has been producing vertical and horizontal packaging machines for nearly 40 years according to its “FLEXIBILITY IN PACKAGING” philosophy, because flexibility is what enables us to satisfy the needs of our customers and create a true direct relationship with them produces VALUE. OMAG: packaging machines and complete packaging lines.